I admit it, landscaping is my gardening weak spot. How to landscape is something of a challenge for me. I know some of the basic landscaping design principles, but have difficulty applying them. Most gardeners have a tendency to buy the plants they like, then plant them where they have the room. I don’t think I’m much different than they are. In designing a landscape, this is a mistake. You need to be more thorough and make an overall plan to start. I purchased my house two years ago from an individual who was the gardener. When we first saw the house it was very apparent to me that she knew how to design a garden. It was well laid out and very attractive. Shade loving plants were in the shade and sun loving plants were in the sun. There were privacy screens from large shrubs and the overall appearance was beautiful. I can only hope to learn to do as well. My challenge now, is to put my personal stamp on an established garden that has been well done by someone with an eye for design, while improving my own design skills. You can come along with me as I learn. But getting back to how to landscape. There are some basic principles for the home landscape, which are very much like setting out individual garden beds. For the first thing you want to do is make sure you have a plan. This is not so different from planning any of her garden site.
. You want to take a look at where the sun comes up, where the sun goes down. What parts of your yard is sunny or shady in the day time?
. Is there a lot of wind? If so, you may want to build or plant some kind of wind break.
. Are there noises from the neighborhood? 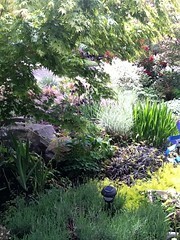 A water feature is wonderful for masking some of that noise, and shrubs may deaden the noise.
. Where are the trees? Where is the shade? If there are places that get too sunny or hot, you may want to add some trees to shade the spot.
. How close is your house to the neighbors. For instance, when we bought our house, we did not notice that windows in adjoining houses are exactly opposite each other. This means you may be looking into your neighbor’s kitchen or living room. Therefore, a privacy screen is one of our top priorities.
. What are you water needs ? Is your site dry or moist? Where is the water? Do you have both wet and dry spots in your yard? I have both. These may be areas for a xeric garden or a rain garden. Now the fun begins. Keep in mind how you are going to use your yard and what kinds of things you like. This video takes a very personal approach to the design process.
. Decide on how much work you want to do in upkeep of your yard. If you are like me, you are a lazy gardener and want to have as easy a time as possible. You may want to enjoy your garden, with some puttering, planting and harvesting; but not a lot of time having to weed or doing a lot of heavy work.
. How much privacy do you want? Most people want some places that are private to have family and friends come over, or just to prevent prying eyes from the neighbors.
. And how much of the area do you want for activities, like a play yard or a pool.
. Do you want a deck or patio incorporated into your space? I love my Trex deck that we put in last year. Now I want to get it covered to shade from the sun.
. If you have a windy area, think about some kind of wind break, whether using trees, shrubs, a fence or some other barrier.
. Privacy concerns can be managed in similar ways by planting trees, shrubs, fences, vines, or using pergolas or trellises to shield your privacy. In designing your landscape, consider the basic garden design principles. The principles are you simplicity of design rhythm balance and proportion and always have a focal point.
. Simplicity means that he been elements of your design are grouped together so that they appear as one unit not a bunch of little pieces. For example group plants in masses so that they appear as one unit.
. Use of repetition of different elements in the landscape can direct your eye through the landscape and develops a sense of unity in the entire landscape design. For example, you may want to use the same plant or group of plants in multiple locations all to develop this sense of repetition, and you can use the same color to achieve the same effect. There are two types of balance to consider, symmetrical and asymmetrical balance.
. Symmetrical balance is more formal and essentially everything is the same on one side of the yard ads on the other.
. Asymmetrical balance uses different elements or object that has the same visual mass on one side as on the other even other not the same. What is the proportion of one element in the design to another?
. Consider the mature size of a plant in relationship to any buildings. In other words, you don’t want to pair up a McMansion with a 2 foot shrub, or a tiny cottage with a huge tree.
. You also need to consider the sizes of one plant in relation to another. Do you really want a tiny plant obscured behind huge grasses?
. And you need to consider the size of these plants in relationship to people. So you wouldn’t want plants that were so tall that you cannot manage them. Nor would you want a shrub that brushes the top of your head every time you walk by.
. The focal point is the place at your eyes end up resting in your landscape. The point can be anything. It can be plant, a piece of garden art, water feature or your front door.
. You will want to have focal points for the different sections of your yard.
. Keeping this in mind, design your landscape to enhance the focal point. Now we come to plant selection. Find the right plant for the right place.
. You’re going to need plants that do well in your area and climate zone. Consider native plants, since they are already acclimated to your area and are resistant to the pests there.
. And you’re going to need plants that do well for the type of growing conditions that you have in your yard.
. You will want to select plants for sun for the areas that get the most sun.
. And you’re going to want to select shade plants for the areas that are shaded.
. Consider other growing conditions like how much water does the site get, and what about rainfall. Do you have reflected light? Does it get hot and sunny or is it cool and damp?
. Does your yard have areas that are alkaline soil or acidic soil? You’ll want to plant plants which prefers these conditions or amend the soil to make it more friendly to them.
. Consider the plant shape. Is that upright or low and spreading? Is it mounded, round, upright or pyramidal? How do those shapes fit into your design?
. You will also want to consider plant color. What color are the flowers foliage is their fault color?
. Many people like to choose plants that have two or three season interest. 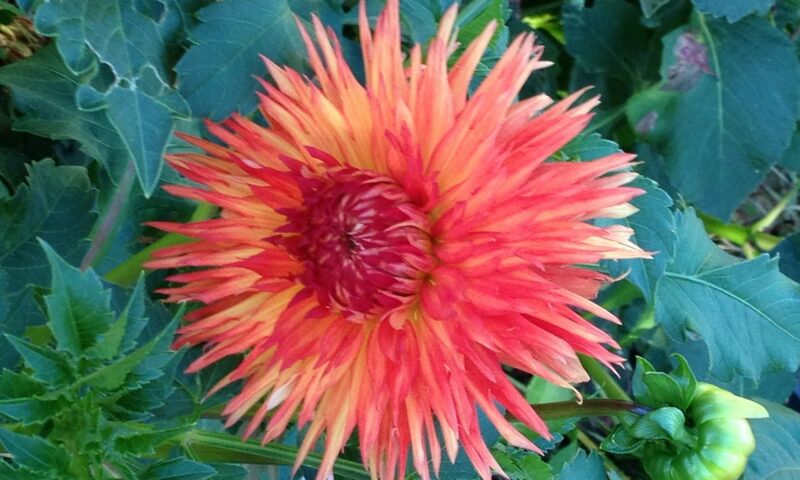 For instance the witchazel has late winter flowers, green leaves during summer, and brilliant foliage in fall. My favorite thing to do is choose plants that bloom in winter, like witch hazel or hellebores. If these don’t do well in your area, I’m sure there are some that do.
. Also consider plant texture. Plants may have your large or find leaves, grasses are wispy.
. What plants do you like? Now is the time to draw your garden plans.
. Draw a map of your yard. Show where all the buildings are, where you’re going to put walkways, and the various areas of your yard, such as the privacy area, play area, vegetable garden, and the like.
. Consider the flow of traffic in your yard. Is it convenient?
. Then consider where to place the plants, taking into consideration their size, growing needs and the artistic elements of the design.
. Draw this all out and make a decision whether the plan will work.
. Rome wasn’t built in a day. Unless you have the money to get help or have a lot of friends to come over, don’t try to put everything in at once. Just do a few of the basics and then add to that as you go along. Now get working on your landscape and start to enjoy your garden!